I would like to find a good mid layer for winter use. Typically we would not be out below 20F. I currently have a waterproof breathable shell and several base layer options, but my mid layer jackets are low quality fleece. I'd love to get a Patagonia down shirt but they are pricey and only 1/4 zip. I need full zip because I tend to overheat quickly. Seems like a light synthetic or down jacket that had zip off sleeves would be ideal, but I have not seen one yet. Closest thing has been some cycling jackets. Any suggestions? I bought a Patagonia nanopuff pullover on sale last fall for this reason. I'm in a warmer climate, but I love the jacket. Recommend googling for on sale, and maybe waiting until spring. Now's beginning to be the good time to buy summer stuff. Are you looking for mid-layer while hiking or once you have stopped? My experience is that when I am hiking a heavy weight base or a featherweight base + light weight fleece (like the Patagonia R1) and shell keeps me quite comfortable at 20F. My daughter likes using a featherweight base + lined wind jacket like the Marmot DriClime Windshirt in those conditions. For when stopped, something puffy is really nice. The best value IMHO are the down jackets from Montbell but they aren't cheap. REI has made a Primaloft Jacket with zip off arms which I often see on the clearance rack in my local store. PS: Starting next Thursday Patagonia beings their annual Memorial Weekend sale. If you have an outlet near you it the outlet price - 40%. They also typically have pretty good sales on their website. uhhhh, Mark--isn't that Labor Day weekend that's coming up? And I thought I was out of sync after missing most of the hiking season! To the OP--I bought a very lightweight fleece vest to use as a midlayer for while I'm actively hiking. Frankly, it turned out to be too warm! Instead, I use a Patagucci Merino 1 long sleeve crew neck (men's) which, over my standard Capilene 2 base layer and under my windshirt was just about right--that with temps in the mid to low 20's and the wind blowing. I also wore Smartwool liner gloves and a Smartwool headband (with a hat I was, again, too warm). Of course as soon as I stopped, the down jacket came out! A lot depends on what kind of weather you expect. The only time I worry about a separate hiking mid-layer is in shoulder season or in alpine areas. Also, as already mentioned, there is a lot of difference between a mid-layer for when you're actively hiking, when you want to be comfortable but not sweat, and the insulation layer needed to keep you warm when you stop to rest or camp! 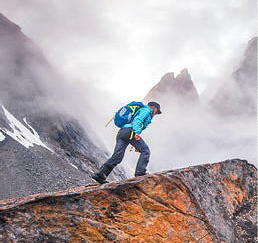 Oh, and REI is also having a sale, as is this site's sponsor backcountrygear.com. I suspect that all the major retailers are having sales!